Admittedly, some of the mystique surrounding Scotch is deserved—it’s one complicated spirit. 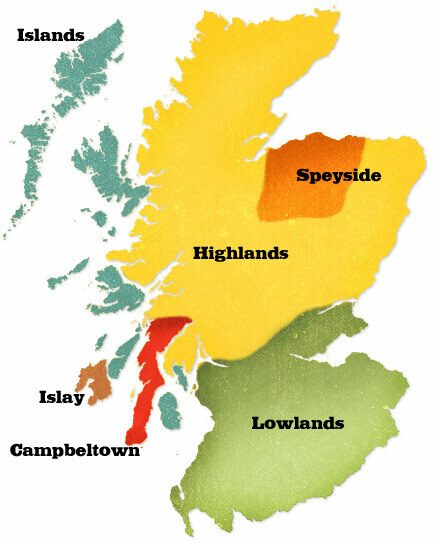 There are six regions of production in Scotland, each with its own distinctive character. The drink itself has five categories: single malt, single grain, blended malt, blended grain, and blended (more on that later). Add in possible ages ranging from 3 years to over 70, and you’ve got a lot of options on your hands. This can be intimidating, sure—but it also means that by sheer numbers alone there’s bound to be a Scotch to suit just about everyone. Yes, even if you don’t have a steely disposition or a pressed suit hanging in your closet. The Scots have been distilling for a good long time now. The earliest recorded mention comes from a 1494 Exchequer Rolls tax listing for “eight bolls of malt to Friar John Cor wherewith to make aqua vitae.” This was probably well into Scotland’s distilling history, given the huge number of bottles this amount of malt would produce. Most historians agree that distilling probably arrived alongside Christianity in the fourth century, both brought to the highlands by booze—and bible-toting monks. The Scottish government first imposed steep distillery taxes in the mid-1600s. In the grand tradition of tax evasion, an underground Scotch industry flourished for the next few centuries. In fact, by 1780, Scotland was home to 8 legal distilleries and 400 illegal ones, and a fierce rivalry arose between tax collectors and illicit distillers. Scotch was smuggled all around the country and hidden anywhere that an empty space could be found, even pulpits and coffins. Low-lying stills were hidden in the tall heather atop the highland cliffs. The law was rendered so useless that the Duke of Gordon motioned to change it in 1823. The Excise Act allowed for the distilling of whisky in exchange for a low licensing fee and set tax on the finished product. Illicit distilling all but ceased. Up until this point, the Scotch that was causing such a fuss was all the same variety: barley malt Scotch. That was before Aeneas Coffey came along and changed the game. The French-born Irishman patented his design for the Coffey still in 1830. The Coffey still was quicker than the pot still, and produced a higher-proof spirit. In the following years, distillers doubled down on efficiency and started experimenting with grain spirits, which eliminated the costly and tedious malting process. Grain Scotch was lighter tasting and less complex than its malt counterpart, so distillers took to mixing the two together, resulting in a widely appealing product called blended Scotch. That said, single malt is still widely considered the highest-quality Scotch out there (“single,” in this case, in that the Scotch has one distillery of origin). Resources abound for finding affordable, good-quality single malts, but “affordable” is highly relative. Any way you slice it, Scotch is a pricey drink. It also doesn’t play terribly well with others—Scotch cocktails are few, but fantastic. Perhaps the most classic is a Rob Roy, which pairs single-malt Scotch with sweet vermouth. This spiced version may just be the perfect autumn cocktail. The thought of pickled fruit may seem strange, but it’s the perfect crisp accompaniment to a cocktail—after all, fruit and pickled vegetables are two popular drink garnishes, and these preserved Pink Ladies taste like a combination of both. This pickled apple recipe has been slightly adapted from Food52. Stir ingredients over ice to chill, then strain into a chilled cocktail glass. Garnish with a pickled apple slice. Combine water, vinegars, syrup, pickling spices, and salt in a small saucepan. Bring to a boil, then reduce heat to low, cover, and simmer for 10 minutes. Taste a bit of the brine for seasoning. Wash, core, and thinly slice apples. Place in a medium glass bowl and add star anise and cinnamon. Strain brine into the bowl, then cover and let cool to room temperature, stirring occasionally. Once they’ve cooled, transfer to pint-size glass jars and top with brine. These will keep for one week in the fridge.